Fiber Flux: Free Crochet Pattern...Silly Monster Mini Tote! 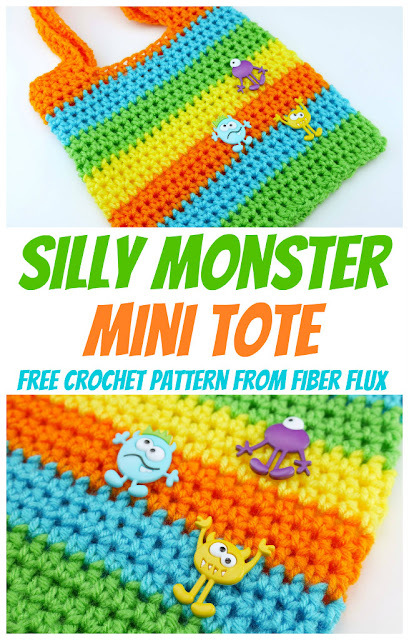 Free Crochet Pattern...Silly Monster Mini Tote! 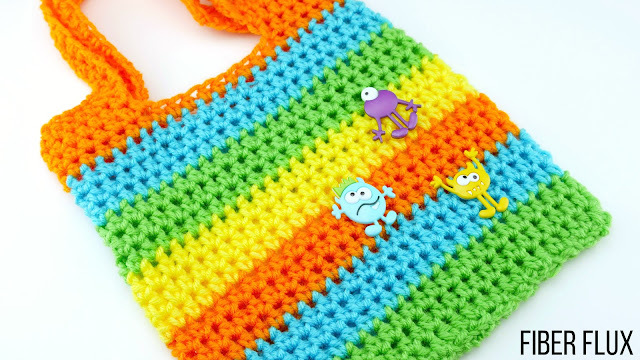 The Silly Monster Mini Tote is a super cute and quick little project to whip up! Fun buttons and bright yarn make this bag whimsical and unique, but simple stitches keep it easy too. I chose silly monsters, but you can use any theme of buttons you like! *Note: I switched colors after three rounds of each color. However, please feel free to work the colors any way you like! Ch 50, join in the ch furthest from the hook to create a large ring. Round 1: Ch 2, then work a hdc in each ch. Join with a sl st in the top most ch of the turning ch with a sl st to close round. Round 2: Ch 2, then work a hdc in each ch. Join with a sl st in the top most ch of the turning ch with a sl st to close round. Repeat round 2 for about 10 inches or until desired height. Don't fasten off/cut the yarn yet and move onto the next section. *Before proceeding, place stitch markers for bag handles. Be sure there is the same number of stitches in between the front two stitch markers and the back two stitch markers. Also be sure that the sides of the bag have an equal number as well. I had 8 in between-front and back (where the handle openings will be, where an arm will go through) I had 12 stitches on either sides of the handles. Please note: your stitch count may vary slightly than what I had, but just be sure that the above all the numbers match up. Round 1: Ch 2 and work a hdc in each st. When you come to the first stitch marker, remove it and work a hdc in that stitch. For the handles shown, ch 30. 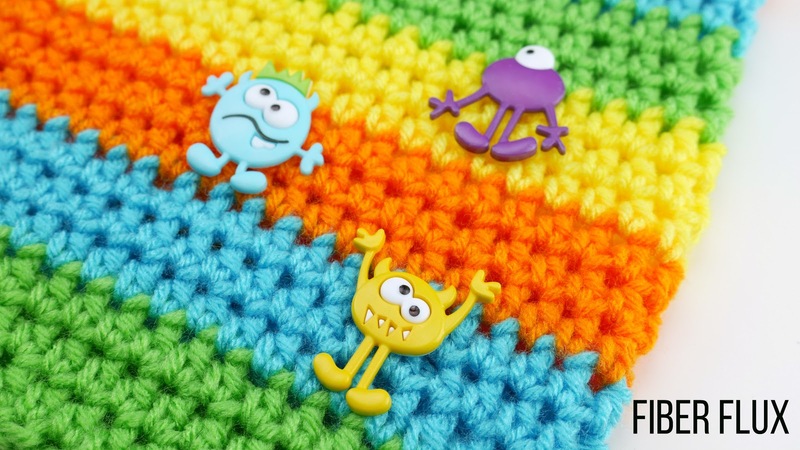 Skip over to the next stitch marker and work a hdc in that st. Work a hdc in each stitch until you arrive at the next marker, then repeat for the other handle (ch 30, and skipping over to the next marker. Continue working a hdc in each st until you reach the end of the round. Join with a sl st to close round. Round 2: Ch 2, then work a hdc in each st all the way around. When you get to that first handle, work a hdc in each ch. Work a hdc in each stitch, then work a hdc in each ch for the other handle. Finsin the round by working a hdc in each remaining stitch. Join with a sl st to close round and fasten off. Round 3: Round 2: Ch 2, then work a hdc in each st all the way around. Join with a sl st to close round and fasten off. Note: If you would like thicker handles than the ones shown in the photos, simply work round 3 until they are the desired width. If you would like longer or shorter handles than the one shown, work more or less chains for the handles in round 1. Sew buttons to decorate your bag, remove any stitch markers, weave in any ends that remain and you're finished! Put a print button on there. Makes it easier for everyone.